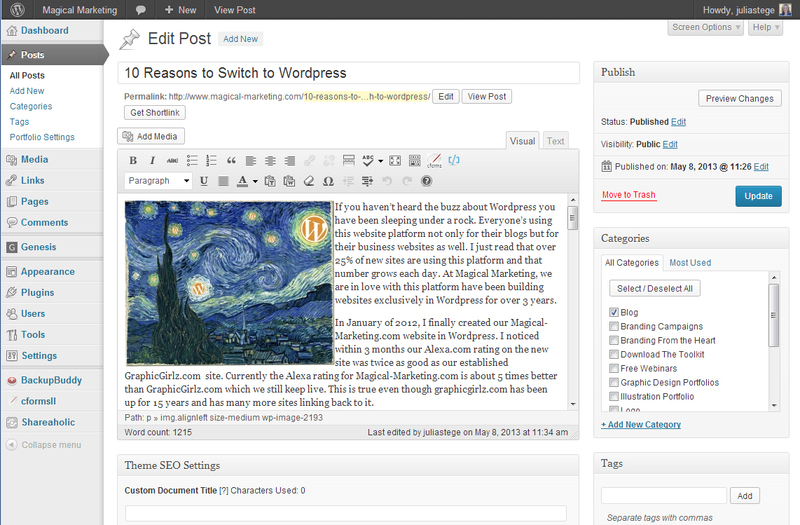 If you haven’t heard the buzz about WordPress you have been sleeping under a rock. Everyone’s using this website platform not only for their blogs but for their business websites as well. I just read that over 25% of new sites are using this platform and that number grows each day. At Magical Marketing, we are in love with this platform have been building websites exclusively in WordPress for over 3 years. In January of 2012, I finally created our Magical-Marketing.com website in WordPress. I noticed within 3 months our Alexa.com rating on the new site was twice as good as our established GraphicGirlz.com site. Currently the Alexa rating for Magical-Marketing.com is about 5 times better than GraphicGirlz.com which we still keep live. This is true even though graphicgirlz.com has been up for 15 years and has many more sites linking back to it. 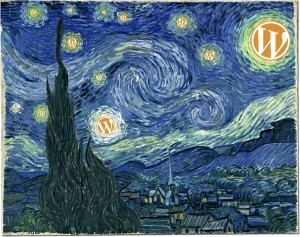 And that’s only one reason we love WordPress. There are many great reasons to change over to WordPress from HTML, Vista Print, Yahoo, GoDaddy, Joomla, or other platforms that I decided to create this list. Here are 10 good reasons to make the change from whatever platform you’re currently on to the WordPress Platform. Google loves a site that is clean, fast, organized, updated frequently and includes a blog and WordPress ranks at the top. Within 2 months of launch, our Magical Marketing website ranked better by 100% than our HTML Graphic Girlz site that had been indexing for 15 years. Also, there are countless plug-ins available for WordPress that will assist you in setting up your SEO like meta tags, title tags, description, links and much more. WordPress has a user-friendly backend that is similar to programs like Microsoft Word, making it simple to update text, photos and media content yourself. Also WordPress is continually improving its Content Management System, adding features such as threaded comments, galleries, revision histories, trash, custom post types, and more. And if you have an assistant, it’s likely she already knows how to use WordPress and can update that for you. If she cannot, there are thousands of WordPress maintenance providers out there for a reasonable price. Widgets are boxes of content that usually show up in the side bar or footer of your WordPress site. These boxes can contain media like photos or videos, testimonials that rotate like a slide show, and interactive elements like opt-in boxes and subscription forms. If you look in the column to the right you’ll see great examples of useful widgets: the opt in box and banners in the side bar plus the Twitter feed, blog roll and events list in the footer. 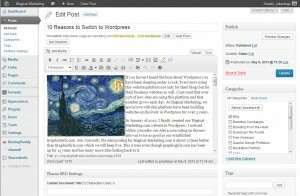 WordPress provides a few dozen widgets to easily place on your site, and custom widgets can be made as well. It’s very easy to move widgets around in your Theme, a handy feature when you want to temporarily emphasize a specific action on your site. WordPress programmers around the world have created a plethora of plug-ins that allow you to add great photo galleries, image sliders, shopping carts, forums, maps, and other great functionality to your site, and they’re easy to install. On the Magical-Marketing.com website home page you see the beautiful slide show at the top of the page … that’s a visible example of a plug-in. Many folks love the Membership Plug In that provides passwords and protected content to members. 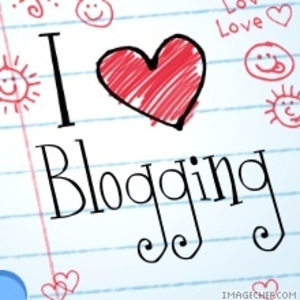 WordPress has the best blogging platform available anywhere. WordPress Blogs feature useful elements such as categories, tags, threaded commenting, gravatars, easy theming, widgets, fantastic moderation controls, anti spam solutions that make using it a breeze. Plus, including a blog to a WordPress site is a great way to attract and involve visitors, and to keep Google paying attention. The Magical-Marketing.com blog attracts hundreds of unique visitors each month who stay an average of 8 minutes. This gives them plenty of time to see what else I have to offer on the site. Your blog is the most attractive page on your site so if you don’t have one, your site visibility is suffering. WordPress sites are programmed to easily show up on iPhones, BlackBerry, Android, iPad, as well as alternative browsers such as text only browsers. Never worry about your site not showing up on someone’s browser or phone. We use Genesis WordPress Platform which keeps the parent theme separate from your custom theme, improving the security of the site and protecting your content from hackers, etc. WordPress also offers plug ins to prevent spam and other intrusions. Your WordPress site can be created to look just like the site you already have, or you can use a pre-designed theme, or create a new custom designed theme. We work with programmers who can take any design I create and make it into a fully functioning WordPress website. One great thing about WordPress, your themes are independent from your content, so you can edit or swap out themes at any time and keep your content and functionality in place. There are no limits to how much content, photos, galleries, plug-ins, themes you can continue to post on your WordPress site. There is no limit to how big your blog and website can grow nor to the number of visitors you can receive. WordPress is used by billions of websites – from the simplest of independent blogs to large brand name websites like Flickr, People, New York Times blog and many more. You may already have a website design that you love (maybe we designed it for you years ago!) and you don’t want it changed, except to include an Integrated Blog. If you have always wanted to be able to post to and update your site yourself, we can convert your site to WordPress as is and include an integrated blog for as little as $500. or if you would like to explore other options for a new WordPress Site, please call Julia at (707) 823-3316 or use her online scheduler at http://www.schedulewithjulia.com to schedule an appointment. Feel free to include your comments! I’d love to know about your experiences with WordPress, what you like about it, or questions you have about the platform. Thank you for this article! It’s true wordpress is the most optimal platform for almost all the web projects. You don’t have to be an expert to manage it but at the same time wp offers the infinite horizons of functionality and options. The highly developed plugins greatly simplify all the operations and make your website running the most pleasant work ever. I’m a new to wordpress, however i have already enjoyed every moment with this tool.